I know I’m a bit behind on this, but I just wanted to wish everyone a Happy Lunar New Year. 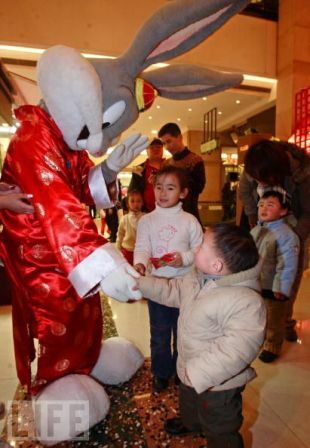 Since 2011 is the Year of the Rabbit, I figured a photo of a certain Looney Tunes character dressed in traditional Chinese garb would be an appropriate way to mark the occasion. Technically, it’s the Year of the Metal Rabbit, but since I don’t have a picture of Bugs wailing on a Fender, I figured the attached picture, courtesy of Life.com, was the next best thing. Anyway, here’s hoping you’re enjoying the Lunar New Year festivities, eating some good food, and, if at all possible, watching some entertaining Hong Kong films. I can’t vouch for the quality of this year’s choices, but for your viewing pleasure, I’ve linked to trailers for Mr. and Mrs. Incredible, All Well That End’s Well 2011, and I Love Hong Kong. Personally, I celebrated Chinese New Year in a very small way — by eating dim sum at a local restaurant. Nobody gave me any red packets. Since there aren’t any Lunar New Year comedies playing in my neck of the woods, I guess I’ll have to pull out an old favorite from my DVD collection. Heck, maybe it’s time to convince my girlfriend to finally watch Needing You. In any event, I’ve got a lot of new Hong Kong and Pan-Asian reviews in the pipeline for LoveHKFilm.com, and I hope you’ve been enjoying the daily updates to Ronin on Empty. I’ll do my best to make it a worthwhile stop on your internet wanderings in the coming year. To you and yours, I wish all of you Long Life, Good Fortune, Health, Happiness, and Good Luck!